I have always hated when the mask comes off when you are not lying down on the bed. With this, I am able to do anything I want and I could be more productive while putting a mask on. It fits my face well and keeps sheet masks moist. It does it's job. Always want to pamper myself and use face masks regularly but I don't like to have to lay down or stay still while using them. This saved me so much time. I was able to multitask with no problems. Whether you use this silicon mask with another sheet mask or a gel mask, it covers your face and keeps everything where it should be. Also doesn't move around when you move. 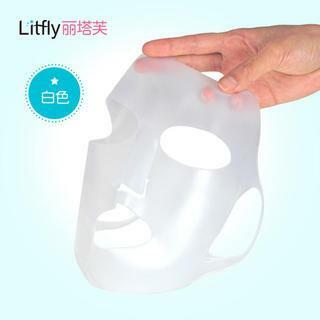 This silicone mask Works amazing, it stays on, and it is not to big or too small. I love this! I had always wished there was a way for me to sleep with a sheet mask on and have it stay on my face so I jumped on the chance after seeing this product and I'm happy with what it got. I was worried that it wouldn't fit my face because usually sheet masks are too big for my face to begin with but this fits surprisingly well. This helps hold in the serums from the paper mask to make sure my skin gets it all!! I really love it, it's really soft and flexible, like a second skin. However, I'm a little confused on how to store it, so that it doesn't get messed up or dirty. For now I'm using a ziploc baggy.. It was a bit too small, but it works, the sheet mask can't come off when you're not lying down. So you can do a lof things while putting a sheet mask on. This was exactly as I expected but it is pulling at the ears. I have a pretty narrow face so I think the dimensions are off. However, I can wear it to cover my spreadable masks for 10 minutes while I do things around the house. Expecting this was small , but it was the right size . My cheeks are on the chubbier side , so yeah. It fits well , this really helps the face mask to stay put when you are trying to do something.